Paris Roubaix VIP 2020. On Sunday April 5. 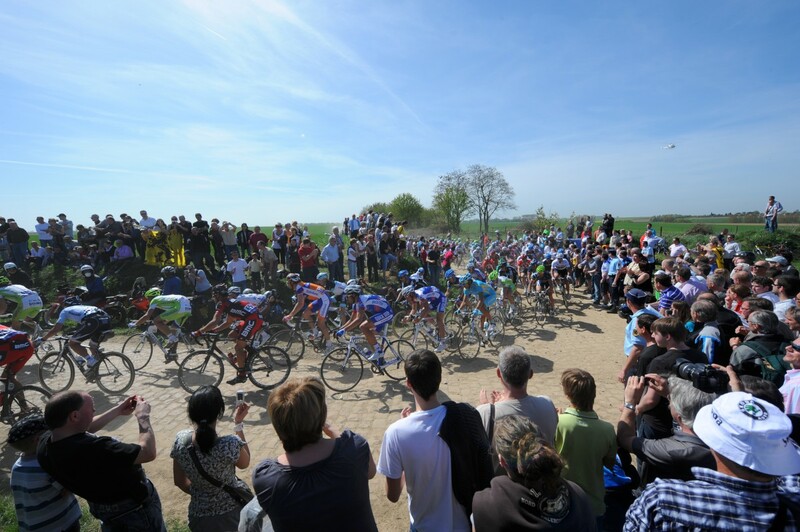 Paris Roubaix; ‘the Hell of the North’ with all its cobbled sections is one of the most iconic bike races on the cycling calendar. The race starts in Compiegne and after a fairly uneventful first section, the ‘secteurs paves’ come hard and fast. In recent years the racing has been mega-fast due to the fine weather conditions but that’s not to say that 2020 is going to be the same. To follow this iconic bike race in comfort, we now offer exclusive VIP access and hospitality options. Paris Roubaix watching the 118th edition of the ‘Queen of the Classics’ the 2020 Paris Roubaix. 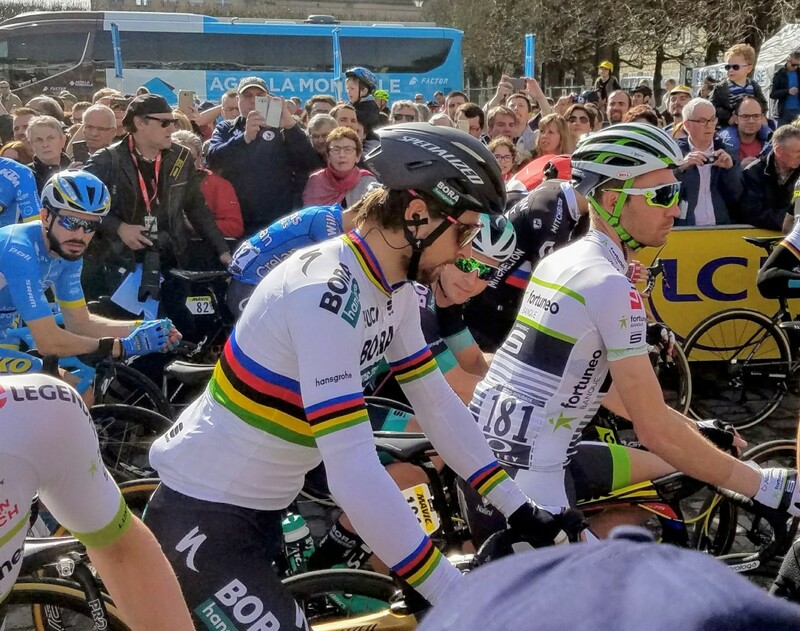 At the start in Compiegne you’ll have breakfast at the VIP lounge followed with exclusive access to the pro cyclist signing-in area, the teams warm-up paddock areas and the fictive start of the race. 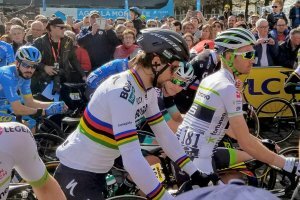 Once the riders are on their way, you will be taken by minibus from Roubaix to Compiegne for a full day at the races from start to finish, with vehicle accreditation which allows to drive on the (off race) roads to ease various stops on the race. The Roubaix Classic Club is located right on the finish line inside the Roubaix Velodrome and is open from 14h30 until 18h00. Whilst at the venue, you’ll be able to follow the race on giant TV screens whilst enjoying an open bar and light snacks. Important note Please note that this is for a ticket only so no hotel or transport is included. At the time of booking you’ll receive a booking confirmation. Nearer the time you’ll receive an itinerary with further information and instructions on your experience including how to gain access. At the end of the day, transport is available to take you back to either the Hotel Mercure Lille Roubaix or Ibis Lille Roubaix if required. Please note that this is a one day coach tour only, so no hotel or other transport is included. Ticket collection and further information At the time of booking you will receive a booking confirmation. Nearer the time you will receive an itinerary with further information and instructions on your experience including how to meet the coach. The club is open from 14h30 until 18h00. Whilst at the venue, you will be able to follow the race on giant TV screens whilst enjoying an open bar and light snacks. Important note please note that this is for a ticket only so no hotel or transport is included. With respect to the selling of any hospitality experiences. Collection and further information, At the time of booking you’ll receive a booking confirmation. Nearer the time you’ll receive an itinerary with further information and instructions on your experience including how to gain access. The start in Compiegne from 08h00 to 11h00. At the start in Compiegne you’ll have breakfast at the VIP lounge followed with exclusive access to the pro cyclist signing-in area, the teams warm-up paddock areas and the fictive start of the race. 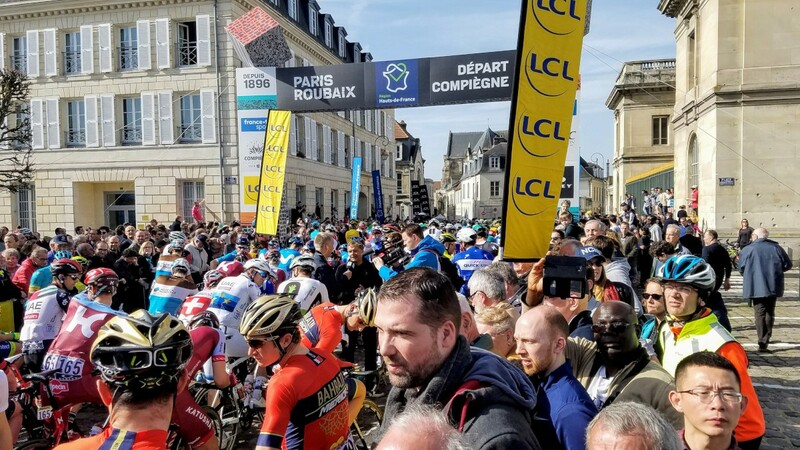 Once the riders are on their way, you’ll take the minibus from Roubaix to Compiegne for a full day at the races from start to finish, with vehicle accreditation which allows to drive on the (off race) roads to ease our various stops on the race. After the start, you make your way to the Trouee d'Arenberg and watch the race on TV in a Cafe. you'll also have a sandwich lunch here. When the riders are nearly there, you’ll walk across to watch them come past and then you go back to the minibus to get to the Roubaix Veldodrome. On arrival you’ll take your place in the VIP area inside the Roubaix Veldrome to await the arrival of the riders. Live coverage of the race on TV screens will be available inside the VIP area. You’ll also receive a copy of the official 2020 Paris-Roubaix road book. Belgium’s main airport is Zaventem International Airport. There are many flights to and from Madrid/ Paris Charles de Gaulle/ Amsterdam/ Frankfurt/ Berlin/ Rome/ London Heathrow/Copenhagen/ Barcelona/ Athens/ Zurich and many more very important cities from all around the Globe. The second most important is Charleroi International Airport. Ryanair has a lot off flights to and from Charleroi. The Airport train station is located below Zaventem International Airport. There are 4 to 5 trains an hour to/from Brussels North, Brussels Central and the main station Brussels Midi. From here all trains connect you to several destinations in Belgium. International Trains will leave to and from Brussels Midi Railway station. The Thalys (fast train between Paris and Amsterdam) has frequent fares between Paris Gare du Nord - Lille - Brussels Midi- Antwerp- Rotterdam - Amsterdam at least every half an hour. The Eurostar (train which connects Great Britian to Continental Europe) from/ to London has upto 9 fares per day. Gent is only a 30 minute ride from Brussels Zaventem Airport. Gent’s main railway station is Sint-Pieters. Lille Railway station is a very important train station from here there are a lot of trains to Brussels/Paris/Lyon/Amsterdam and many other cities in Europe. On our way back to Brussels airport we can drop you at Lille Railway station. Once we receive your request we contact the tour operator if the packages are available. When the tour operator confirms to us. We confirm to you and will send you the exact prices. If you agree we will send you the program and invoice with a deposit fee. We tend and try to reply within 24 hours and send all over within 48 hours. The finish from 14h30 to 18h00 at the Roubaix Velodrome VIP area After you have parked at the official parking, you will take your place in the VIP area inside the Roubaix Velodrome to await the arrival of the riders. You will have unlimited access to the open bar and a selection of hors d'oeuvres will be served. Live coverage of the race on TV screens will be available inside the VIP area. You will also receive a copy of the official 2019 Paris-Roubaix road book. The Roubaix Classics Club is located right on the finish line inside the Roubaix Velodrome and is open from 14h30 until 18h00. Whilst at the venue, you will be able to follow the race on giant TV screens whilst enjoying an open bar and light snacks. Ticket collection and further information At the time of booking you will receive a booking confirmation. Nearer the time you will receive an itinerary with further information and instructions on your experience including how to gain access. The start in Compiegne from 08h00 to 11h00. At the start in Compiegne you’ll have breakfast at the VIP lounge followed with exclusive access to the pro cyclist signing-in area, the teams warm-up paddock areas and the fictive start of the race. 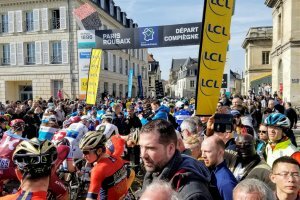 Once the riders are on their way, you’ll take the minibus from Roubaix to Compiegne for a full day at the races from start to finish, with vehicle accreditation which allows to drive on the (off race) roads to ease our various stops on the race. Race viewing and Cafe stop at Trouee d'Arenberg After the start, you make your way to the Trouee d'Arenberg and watch the race on TV in a Cafe. you'll also have a sandwich lunch here. When the riders are nearly there, you’ll walk across to watch them come past and then you go back to the minibus to get to the Roubaix Veldodrome. The finish from 14h30 to 18h00 at the Roubaix Velodrome VIP area. On arrival you’ll take your place in the VIP area inside the Roubaix Veldrome to await the arrival of the riders. You’ll have unlimited access to the open bar and a selection of hors d'oeuvres will be served. Live coverage of the race on TV screens will be available inside the VIP area. You’ll also receive a copy of the official 2019 Paris-Roubaix road book.